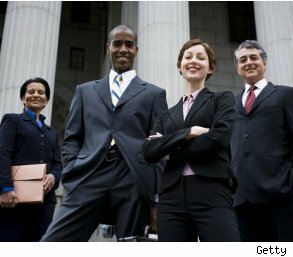 The legal profession is among those that are flourishing right now. Twenty-nine percent of lawyers interviewed for a recent survey plan to hire in the next quarter, and none of them -- not one -- plans to lay anyone off. Those are the latest stats from the Robert Half Legal Hiring Index. That's not only good news for out-of-work lawyers, but for their support staff as well. And legal professional confidence is also on the rise. The vast majority (81 percent) of lawyers polled are at least somewhat confident in their organizations' ability to expand in the second quarter, and litigation is the practice area predicted to see the most growth. Other areas expected to grow are general business/commercial, and bankruptcy/foreclosure law. "The business environment remains competitive, and law firms are adding staff to help them expand their client base and enhance service offerings," said Charles Volkert, executive director of Robert Half Legal. "Law firms, in particular, are hiring on a full-time and project-basis to keep up with growing business demand in hot practice areas such as litigation." So what types of legal professionals are in the most demand? "Law firms are seeking associates with five or more years of experience who can hit the ground running, guiding clients through complex matters related to corporate and commercial litigation, insurance defense and individual lawsuits," Volkert said. "Companies that are seeing renewed business activity need help handling an increase in commercial transactions." Volkert also said that attorneys and legal support professionals are needed to support an increase in personal bankruptcy filings and residential foreclosures. While there remains a large pool of available talent in the job market, half of the lawyers polled (50 percent) report difficulty recruiting skilled legal professionals. So if you're a skilled attorney, paralegal, legal secretary or assistant, or law clerk and have experience, this could be your lucky quarter. Those surveyed noted they most likely will hire lawyers (95 percent), followed by paralegals (49 percent), legal secretaries/assistants (20 percent) and law clerks (19 percent). "As law firms continue to focus on enhancing their service offerings, experienced associates with strong business development skills and valuable client contacts should remain marketable," Volkert said. The survey was developed by Robert Half Legal, a legal staffing firm specializing in lawyers, paralegals and other legal professionals. It was conducted by an independent research firm and is based on telephone interviews with 100 lawyers at law firms with 20 or more employees, and 100 corporate lawyers at companies with 1,000 or more employees. All of the respondents have hiring authority within their organizations.